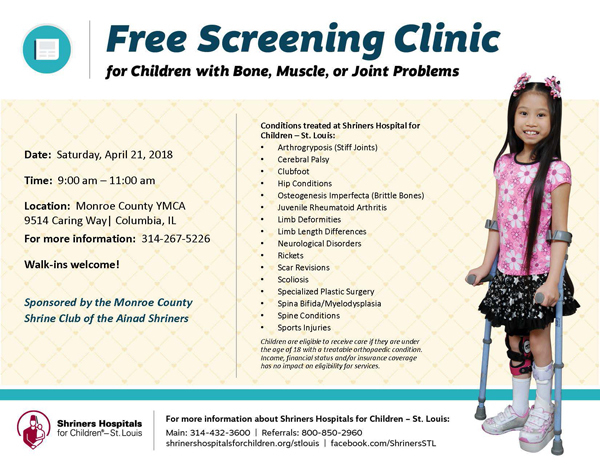 April 21 — FREE Screening clinic for orthopaedic conditions — for Shriners Hospitals for Children. All children under the age of 18 are eligible. If you suspect your child may have an orthopedic condition, this free screening clinic is an opportunity for a local physician to evaluate your child and, if necessary, refer your child to seek treatment at Shriners Hospitals for Children. Families need not know a member of the Shriners fraternity to participate.